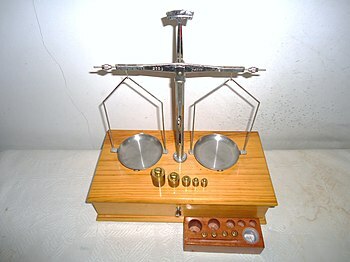 Finely crafted pan balance or scales with boxed set of standardized gram weights sequenced in units of mass. Such scales are used to make the most accurate of fine measurements, such as in the needs of empirical chemistry. Robust weights like these hexagonal decimal-scaled antiques were used for trade into the late 20th century. The avoirdupois system (/ˌævərdəˈpɔɪz, ˌævwɑːrdjuːˈpwɑː/; abbreviated avdp) is a measurement system of weights which uses pounds and ounces as units. It was first commonly used in the 13th century and was updated in 1959. In 1959, by international agreement, the definitions of the pound and ounce became standardized in countries which use the pound as a unit of mass. The International Avoirdupois Pound was then created. It is the everyday system of weights used in the United States. It is still used, in varying degrees, in everyday life in the United Kingdom, Canada, and some other former British colonies, despite their official adoption of the metric system. The avoirdupois weight system's general attributes were originally developed for the international wool trade in the Late Middle Ages, when trade was in recovery (explained below). It was historically based on a physical standardized pound or "prototype weight" that could be divided into 16 ounces. [a] There were a number of competing measures of mass, and the fact that the avoirdupois pound had three even numbers as divisors (half and half and half again) may have been a cause of much of its popularity, so that the system won out over systems with 12 or 10 or 15 subdivisions. The use of this unofficial system gradually stabilized[b] and evolved, with only slight changes in the reference standard or in the prototype's actual mass. Over time, the desire not to use too many different systems of measurement allowed the establishment of "value relationships", with other commodities metered and sold by weight measurements such as bulk goods (grains, ores, flax) and smelted metals; so the avoirdupois system gradually became an accepted standard through much of Europe. In England, Henry VII authorized its use as a standard, and Queen Elizabeth I acted three times to enforce a common standard, thus establishing what became the Imperial system of weights and measures. Late in the 19th century various governments acted to redefine their base standards on a scientific basis and establish ratio-metric[clarification needed] equations to SI metric system standards. They did not always pick the same equivalencies,[clarification needed] though the pound remained very similar; these independent legal actions led to small differences in certain quantities, such as the American and Imperial pounds. An alternative system of mass, the troy system, is generally used for precious materials. The modern definition of the avoirdupois pound (1 lb) is exactly 6999453592370000000♠0.45359237 kilograms. The word avoirdupois is from Anglo-Norman French aveir de peis (later avoir du pois), literally "goods of weight" (Old French aveir, as verb meaning "to have" and as noun meaning "property, goods", comes from the Latin habere, "to have, to hold, to possess something"; de = "from"/"of", cf. Latin; peis = "weight", from Latin pensum). This term originally referred to a class of merchandise: aveir de peis, "goods of weight", things that were sold in bulk and were weighed on large steelyards or balances. The units reached use by wool traders in the Kingdom of England and the Low Countries during the end of the High Middle Ages as population growth and the Renaissance gave rise to a newly populous town population of a middle class. The avoirdupois weight system is thought to have come into use in England circa 1300. It was originally used for weighing wool. In the early 14th century several other specialized weight systems were used, including the weight system of the Hanseatic League with a 16-ounce pound of 7003720000000000000♠7200 grains and an 8-ounce mark. However, the main weight system, used for coinage and for everyday use, was based on the 12-ounce tower pound of 7003540000000000000♠5400 grains. From the 14th century until the late 16th century, the systems basis, the avoirdupois pound, the prototype for today's international pound was also known as the wool pound or the avoirdupois wool pound. The earliest known version of the avoirdupois weight system had the following units: a pound of 7003699200000000000♠6992 grains, a stone of 14 pounds, a woolsack of 26 stone, an ounce of ​1⁄16 pound, and finally, the ounce was divided into 16 "parts". The earliest known occurrence of the word "avoirdupois" (or some variant thereof) in England is from a document entitled Tractatus de Ponderibus et Mensuris ("Treatise on Weights and Measures"). This document is listed in early statute books under the heading 31 Edward I dated 2 February 1303. More recent statute books list it among statutes of uncertain date. Scholars nowadays believe that it was probably written between 1266 and 1303. Initially a royal memorandum, it eventually took on the force of law and was recognized as a statute by King Henry VIII and Queen Elizabeth I. It was repealed by the Weights and Measures Act 1824. In the Tractatus, the word "avoirdupois" refers not to a weight system, but to a class of goods, specifically heavy goods sold by weight, as opposed to goods sold by volume, count, or some other method. Since it is written in Anglo-Norman French, this document is not the first occurrence of the word in the English language. Three major developments occurred during the reign of Edward III (r. 1327-77). First, a statute known as 14o Edward III. st. 1. Cap. 12 (1340) "Bushels and Weights shall be made and sent into every County." The second major development is the statute 25o Edward III. st. 5. Cap. 9. (1350) "The Auncel Weight shall be put out, and Weighing shall be by equal Balance." [English translation:] so that the Sack of Wooll weigh no more but xxvi. Stones, and every Stone to weigh xiv. l.
The third development is a set of 14th-century bronze weights at the Westgate Museum in Winchester, England. The weights are in denominations of 7 pounds (corresponding to a unit known as the clip or wool-clip), 14 pounds (stone), 56 pounds (4 stone) and 91 pounds (​1⁄4 sack or woolsack). The 91-pound weight is thought to have been commissioned by Edward III in conjunction with the statute of 1350, while the other weights are thought to have been commissioned in conjunction with the statutes of 1340. The 56-pound weight was used as a reference standard as late as 1588. A statute of Henry VIII (24o Henry VIII. Cap. 3) made avoirdupois weights mandatory. In 1588 Queen Elizabeth increased the weight of the avoirdupois pound to 7003700000000000000♠7000 grains and added the troy grain to the avoirdupois weight system. Prior to 1588, the "part" (​1⁄16) was the smallest unit in the avoirdupois weight system. In the 18th century, the "part" was renamed "drachm". Note: The plural form of the unit stone is either stone or stones, but stone is most frequently used. The 13 British colonies in North America used the avoirdupois system, but continued to use the British system as it was, without the evolution that was occurring in Britain in the use of the stone unit. In 1824 there was landmark new weights and measures legislation in the United Kingdom that the United States did not adopt. In the United States, quarters, hundredweights, and tons remain defined as 25, 100, and 7002907184740000000♠2000 lb respectively. The quarter is now virtually unused, as is the hundredweight outside of agriculture and commodities. If disambiguation is required, then they are referred to as the smaller "short" units in the United States, as opposed to the larger British "long" units. Grains are used worldwide for measuring gunpowder and smokeless powder charges. Historically, the dram has also been used worldwide for measuring gunpowder charges, particularly for shotguns and large black-powder rifles. ^ School science curricula, especially empirical physical chemistry courses, often introduce students to careful measurements using a pan balance and standardized weights. These are essentially prototype weight clones. ^ Great trade fairs grew up in various sites in Europe, and their regulation and enforcement would act to define such measures. ^ United States National Bureau of Standards. "Appendix C of NIST Handbook 44, Specifications, Tolerances, and Other Technical Requirements for Weighing and Measuring Devices, General Tables of Units of Measurement" (PDF). p. C-12. Archived from the original (PDF) on 2006-11-26. ^ a b c d e f g h i "pound avoirdupois". www.sizes.com/units/pound_avoirdupois.htm. 17 April 2012. Retrieved 13 September 2016. ^ a b c United States. National Bureau of Standards (1959). Research Highlights of the National Bureau of Standards. U.S. Department of Commerce, National Bureau of Standards. p. 13. Retrieved 12 July 2012. ^ Hensleigh Wedgwood (1882). Contested etymologies in the dictionary of the Rev. W. W. Skeat. Trübner & Co. p. 14. Retrieved 2 January 2012. ^ Chambers's encyclopaedia: a dictionary of universal knowledge for the people. W. and R. Chambers. 1868. p. 583. Retrieved 2 January 2012. ^ Horace Wilmer Marsh; Annie Griswold Fordyce Marsh (1912). Constructive text-book of practical mathematics. J. Wiley & sons, inc. p. 79. Retrieved 1 January 2012. ^ United States. National Bureau of Standards. weights and measures. Taylor & Francis. p. 22. GGKEY:4KXNZ63BNUF. Retrieved 1 January 2012. ^ Skinner, F.G. (1952). "The English Yard and Pound Weight". Bulletin of the British Society for the History of Science. 1 (7): 186. doi:10.1017/S0950563600000646. ^ Desiderius Erasmus; Alexander Dalzell; Charles Garfield Nauert (2003). The Correspondence of Erasmus Letters 1658 to 1801: January 1526-March 1527. University of Toronto Press. p. 607. ISBN 978-0-8020-4831-8. Retrieved 2 January 2012. ^ The statutes at large: from the ... year of the reign of ... to the ... year of the reign of . 1763. pp. 148–9. Retrieved 31 December 2011. ^ The statutes at large: from the ... year of the reign of ... to the ... year of the reign of . 1763. p. 227. Retrieved 31 December 2011. ^ a b The statutes at large: from the ... year of the reign of ... to the ... year of the reign of . 1763. p. 264. Retrieved 31 December 2011. ^ Skinner, F.G. (1952). "The English Yard and Pound Weight". Bulletin of the British Society for the History of Science. 1 (7): 185. doi:10.1017/S0950563600000646. Look up avoirdupois system in Wiktionary, the free dictionary. Chisholm, Hugh, ed. (1911). "Avoirdupois" . Encyclopædia Britannica. 3 (11th ed.). Cambridge University Press. p. 66. The pound or pound-mass is a unit of mass used in the imperial, United States customary and other systems of measurement. Various definitions have been used; the most common today is the international avoirdupois pound, which is legally defined as exactly 0.45359237 kilograms, and which is divided into 16 avoirdupois ounces. The international standard symbol for the avoirdupois pound is lb; an alternative symbol is lbm, #, and ℔ or ″̶. The stone or stone weight is an English and imperial unit of weight now equal to 14 pounds (6.35029318 kg). The earliest recorded systems of weights and measures originate in the 3rd or 4th millennium BC. Even the very earliest civilizations needed measurement for purposes of agriculture, construction, and trade. Early standard units might only have applied to a single community or small region, with every area developing its own standards for lengths, areas, volumes and masses. Often such systems were closely tied to one field of use, so that volume measures used, for example, for dry grains were unrelated to those for liquids, with neither bearing any particular relationship to units of length used for measuring cloth or land. 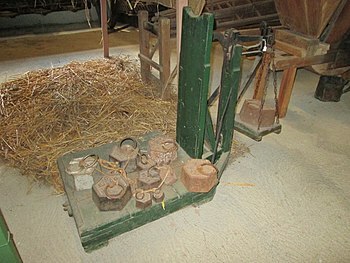 With development of manufacturing technologies, and the growing importance of trade between communities and ultimately across the Earth, standardized weights and measures became critical. Starting in the 18th century, modernized, simplified and uniform systems of weights and measures were developed, with the fundamental units defined by ever more precise methods in the science of metrology. The discovery and application of electricity was one factor motivating the development of standardized internationally applicable units.